The T-50 Golden Eagle at the Dubai airshow. The T-50 Golden Eagle is a family of supersonic advanced trainers and multirole fighters jointly developed by Korea Aerospace Industries with Lockheed Martin beginning in the late 90s. The T-50 is South Korea's first indigenous supersonic aircraft and one of the world's few supersonic trainers. It took its maiden flight in 2002 and entered active service with the Republic of Korea Air Force in 2005. The T-50 trainer was further developed into aerobatic and combat variants, namely T-50B, TA-50, and FA-50. 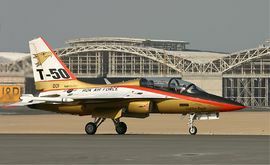 Ten T-50B are in the South Korean air force's aerobatics team. In 2011, the first squadron of TA-50, T-50's light attack variant, became operational. The maiden flight of FA-50, T-50's multirole fighter variant comparable to KF-16, also took place in 2011. This page was last modified 06:45, 22 August 2011.